1. History continues. This is a worrisome fact that we can no longer ignore. In the current situation, it is useful to re-examine the old Marxist axiom of the proletariat’s assumption of its role as an historical subject. What does the proletariat mean today? Which changes has this class gone through? And who can, at present, pretend toward the role of a historical subject? 2. Marx was always eager to relate revolutionary changes in industry to the impending political revolution. To him, it was clear that the steam-engine and other technical innovations of the 18th century contributed more to the revolution of social life than the most prominent political event. In more recent times, it is obvious that the character of labour itself has changed radically, becoming less and less material. More and more people are involved in productive processes whose essence differs fundamentally from classical industrialist production. Sandwiched / Человек-Бутерброд from chto delat on Vimeo. A film by Dmitry Vilensky based on the action in public space realized by the workgroup Chto Delat? “sandwichmen” and “sandwichwomen”. Each of them put on two advertising signs. The front one was empty. Language on strike. On the rear sign there were written various puzzling questions concerning the meaning and dignity of labour. The sandwichmen and sandwichwomen were handling newspapers to the passers by. The newspapers were also empty, except for their last page, where all the questions were listed together. Did you dream of this job when you were a child? Is work a woman thing? Is work a man thing? Is work a common thing? Does work make you free? Who does not work, is not? Are you afraid of the authorities? Are the authorities afraid of you? Let us be afraid together? In the beginning is the scream. We scream.When we write or when we read, it is easy to forget that the beginning is not the word, but the scream. Faced with the mutilation of human lives by capitalism, a scream of sadness, a scream of horror, a scream of anger, a scream of refusal: NO. The films shows different way of almost all existing traditional demonstration’s chanting slogans in Europe. Due to the cut of the film this activity in film is shown in condenssed, almost comic form mixing moment of pure exaltation and concentration. In the construction of the installation this activity sympolise the role of multitude with its features based on affects, linguistic production and virtuosity in action. This film is a characteristic example of the video documentaries that Vilensky has shot in St Petersburg, Moscow and Berlin. In this case, he focuses on workers on a car assembly line in Nizhnyi Novgorod. The monotonous gallery of images is interrupted by shots of people leaving the building somehow too quickly. The context demonstrates that they are workers in the same factory, now going home from work. However, the scenes are more reminiscent of Hollywood disaster films with people running out of a skyscraper where a time bomb is ticking away: the building contains a machine that will destroy the existing order. This film was projected onto the front of the installation. It was made in the Gorky Automobile Plant in Nizhny Novgorod, which was build in 1929 by Henry Ford and has since been Russia’s leading car manufacturer. In ‘Production Line,’ it was important for me to reflect the most basic work activity (work on an assembly line), forcing the audience to look at workers once again after a long break. Approaching the proletariat is important on a symbolic level; in a society dominated by financial speculation and service, the notion of physical labor itself has been forced to the periphery, but work goes on, and never really vanished from post-capitalist society. video film // Toni Negri speaks. Multitude or Working Class? We all agree to the fact that we want to fight capital and renew the world. But I think this ain’t conceivable as a poetical process. Because the name ”multitude“ is not a poetical notion, but a class concept. When I talk about multitude as a class concept, I talk about the fact that workers today work in the same and in different ways compared to those they worked some centuries ago. The working class and its class composition are quite different in the distinct periods that followed each other since the beginning of the industrial age. We all agree to the fact that we want to fight capital and renew the world. But I think this ain’t conceivable as a poetical process. Because the name ‘multitude’ is not a poetical notion, but a class concept. When I talk about multitude as a class concept, I talk about the fact that workers today work in the same and in different ways compared to those they worked some centuries ago. The working class and its class composition are quite different in the distinct periods that followed each other since the beginning of the industrial age. Alexei Penzin & antijob.nu.ru /// Dialogue No. 2: So where the hell are your classes? The problem of class in contemporary society is one of the most common and wide-spread rebukes hurled at the Left. “Where are your classes? Show us the oppressed class, the class with that special historical potential, the class that might become a revolutionary subject!” Some of the Left’s representative will answer argumentatively, that the working class was re-dislocated in the process of the international division of labour. Others still might also say that post-industrialism has, in a certain (medial, ideological) way, displaced the theme of production, and with it, the worker, from its society of consumers. For some reason, the opponents of the Left never ask question as to the ruling class of today. Maybe this is because the answers are more than obvious: today’s heavy-weight bourgeoisie has long since lost any semblance of humility, as their appearance in the mass-media takes on the splendour of a religious ceremony. If big business marks itself so openly, opposing itself to the rest of society, its totality cannot help but produce an oppressed class. In this society, everyone belongs to the proletariat, which is separated from the upper classes by an ever-widening gulf that seems impossible to breach. Distributed unevenly, the normalizing anaesthesia of “prosperity” only serves to hide a growing class distance, which we are no capable of imagining in any clear form. Alexey Penzin (A.P. ): How did your project begin? With which ideological orientations is it connected? antijob 1: The site antijob.nm.ru is one of the projects of the group Autonomous Action, represented by the journal “Avtonom” (on the web: www.avtonom.ru ). Our ideology is more or less anarachist. When we founded Autonomous Action, we didn’t want to use the term “anarchism”, because we felt that today the word “anarchy” was a loaded term with negative connotations. The idea of antijob has been around since some time in the year 2000. We publish compromising material, which exposes companies that injure the rights of their employees. That is, somebody was hired by some company, which then let him down in some way, so now the person describes this experience and publishes it on our site. Aside from this material, our site also contains many theoretical texts, including critical theories of the capitalist system of hired labour, consumerism, the society of the spectacle etc. Antonio Negri /// Multitude or Working Class? The organisation of labour has indeed damned changed from the 18th century until now, as well as the political and technical class composition; and also the way the class builds up its class consciousness is extremely different. If we use the concept of working class and the concept of organisation of labour homogeneously and uniquely well be mistaken profoundly. I think that after 68 and with the beginning of the neo-liberal counterrevolution the structure of organising labour and in consequence the organisation, the making of class composition has changed profoundly. The factory stays no longer in the centre of value production. The value is created by putting to work the whole of society. We call multitude all the workers who are put to work inside society to create profit. We consider all the workers in the whole of society to be exploited, men, women, people who work in services, people who work in nursing, people who work in linguistic relations, people who work in the cultural field, in all of the social relations, and in so far as they are exploited we consider them part of the multitude, inasmuch as they are singularities. We see the multitude as a multiplicity of exploited singularities. The singularities are singularities of labour; anyone is working in different ways, and the singularity is the singularity of exploited labour. Michael Hardt // Who is Toni Negri? In the early 60s Negri joined the editorial group of Quaderni Rossi , a journal that represented the intellectual rebirth of Marxism in Italy outside of the realm of the communist party. The philosophical framework developed in the context of the journal came to be known as ” operaismo ” (workerism) and one of its central political concepts was “the refusal of work,” which did not refer to a refusal of creative or productive activity but rather a refusal of work within the established capitalist relations of production. In the 1970s, Negri’s work continued to focus on labor, but the primary site of analysis shifted outside of the factory walls. Earlier Negri and his colleagues had centered their analyses on the working class (by which they understood male industrial factory workers), but now they developed a broader notion of proletariat that was meant to refer to all those whose labor is commanded and exploited under the rule of capital. They conceived their analyses and practices as moving out of the factory and into society. In these years Negri developed a theory of the “social worker” that tried to grasp the new subjective figure of social production and revolt. In effect, this intellectual project drew into question the conceptual division posed by the traditional Marxist conceptions of productive and unproductive or productive and reproductive labor along with the traditional political divisions between waged workers, unwaged workers, and the unemployed. The primary political consequence of these theories was to recognize all the various figures of social production, the entire proletariat conceived in this broad sense, as capable of revolt. Negri’s theoretical work in this period culminated in Marx Beyond Marx, a reinterpretation of Marx’s work that extended it beyond the limits of Marx’s own time and vision. DR: As I was preparing for our conversation, I hit upon a link to a text “Justification of Art or the End of Intelligentsia”, written for “Flash Art” in 1996. Yet I was both disappointed and intrigued to find that this link was dead: I was only able to find its ephemeral digital artefacts. I thought this dead link as a point of departure for our conversation on intellectual labour. In how far do you see the crisis of the Russian intelligentsia during the 1990s as a concession to the ephemeral production of “concepts” and “projects”, which very soon lose their meaning? And does the fact that the link is dead mean that your views from 5 years ago have lost any of their original significance? VM: As far as I can remember, the text you’re talking about provoked the enthusiasm of Marat Guelman. I don’t know whether Marat actually read the text or not, but he immediately became enthused with the term “post-intellectual”. He wanted to translate the text into Russian, and to publish it on his site, which is probably how the link appeared. But his interest faded as quickly as it came up, which might be why the link died very soon. This situation is very symptomatic and brings me to your question. My view then was that Russia’s “thinking class” had departed from the idea of the “intelligentsia” without ever identifying itself with the conception of the intellectual (in the sense of Sartre). By the early 1990s, the dissident intelligentsia’s conception of intellectual labour had already become the subject of wide-spread criticism in the press, and the figure of the “intellectual” was something that was hardly understood or understood intuitively, but rejected as inappropriate to the social perspectives of neo-liberal reform. Members of the post-intelligentsia and pseudo-intellectuals opted for media that were far more fast-paced and, at the same time, more socially effective. This gave their “intellectual labour” a new temporality: it was necessary to work quickly, more superficially, with great flexibility. Determined by an exalted metaphysical view of money and an ethos of “standing up for one’s right to proper pay”, this new form of “post-intellectual” labour demanded a certain kind of anti-fundamentalism and plasticity, an ability to adjust to new tasks, epitomized most compactly by the political technologist. Such highly talented individuals are willing to sell their intellectual services to political groups or leaders with views that differ drastically from his-her own. 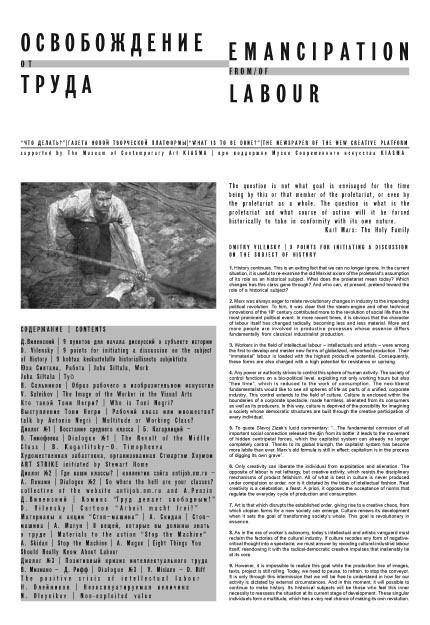 By now, Russia’s political technologies have actually become one of Russia’s main export goods, although they have very little in common with the quality of a classical European intellectual’s products; the European intellectual’s production actually means something because it is firmly based in a ethos of convictions. This is something that the “post-intellectual” has not reached. Е ven if the neo-liberals organized rock-concerts and commercials on TV; “post-intellectual” production has not yet established one serious analytical or scholarly institution. Furthermore, what makes me wary is that all the deconstructions of the intelligentsia’s codex were quite obviously motivated by the authorities: in the situation of ethical relativism, as the critical senses of the “thinking class” dulled to the point of social dissolution, it was much easier to conduct radical reforms and whole-sale privatization. In the ancient world, there was no such concept as ‘work’ that would have covered creative self-expression and earning one’s daily bread. Work was seen not as a means of self-improvement but as a drudgery – after all, it took away from important things such as politics or philosophy. Even Christianity cast work as a punishment: banished from Paradise, we are obliged to eat our bread in the sweat of our brow. Industriousness was not a pathway to salvation. The Protestant work ethic, i.e. seeing work as a personal struggle for salvation, did not emerge until the early days of capitalism, at which point the productive use of time by the small entrepreneur became the ideal. The secular ascetic described by Benjamin Franklin gained his pleasure from gathering a fortune, not spending it as in the good life of Antiquity. The indignation of Marxists drew upon the pre-industrial independence of the craftsman, but they nevertheless admired centralized production, which was at that time putting an end to the business of small independent producers. Modernization, from the point of view of liberals and Marxists alike, and for better or worse, means that production exists primarily for trade, not for self-sustenance. Marx said that work was productive only when it produced a return on investment in a system where work and ownership were segregated. Hannah Arendt felt that Marx demoted human beings to toiling animals whose only options were productive slavery and unproductive freedom. Marx eulogized work as the highest ideal and preached liberation from its servitude. If you lived in what was once the Soviet Union, you might remember the official slogans and images that glorified the working class. You will probably also remember the wide-spread, mutual antipathy between workers and intellectuals which accompanied such glorifications. To the intellectual of those times, the representative of a broad section of Soviet society, the worker contemptuously called by the nickname of “hegemon” (1)  was a poorly educated, lazy slob, an embezzler and a crook, who tyrannized the poor intellectual for seventy-some odd years. In contrast, the Soviet worker understood anyone with a higher education as a useless mama’s boy, looking for the easy life; his social-productive existence as a parasite on the proletarian body could not be justified in any way. In this sense, one can understand why there was hardly any after-hours contact between workers and intellectuals during the Soviet era. Today, the officious proletarian pathos of the Soviet type has become a part of the past, along with its mythology of the working class. From this perspective, it has become interesting to examine the origins of its visualization. Boris Kagarlitsky (B.K. ): The conclusions drawn in this book are very simple: the core of resistance in our time is not to be found in the hungry masses, but in the middle class. I attempt to show that there are, in fact, neither losers nor winners. The system constantly reconfigures its social and professional structures. A person who makes a lot of money is also a victim of exploitation, sometimes even more so than somebody who is poorly paid. O.T. As far as I understand, your book talks about the fact that we are witnessing a systemic crisis. The old industrial relationships of global capitalism come into conflict with the new forces of production, developing through the advent of high technology. This text is compiled from materials published at the web page The Seven by Nine Squares. We call for all artists to put down their tools and cease to make, distribute, sell, exhibit or discuss their work from January 1, 1990 to January 1, 1993. We call for all galleries, museums, agencies, alternative spaces, periodicals, theaters, art schools etc., to cease all operations for the same period. Art production has been mystified and co-opted; its practitioners have become manipulable and marginalized through self-identification with the term “artist” and all it implies. To call one person an artist is to deny another an equal gift of vision; thus the myth of the “genius” becomes an ideological justification for inequality and repression. What an artist considers to be his or her identity is a schooled set of attitudes; preconceptions which imprison humanity in history. It is the roles derived from these identities, as much as the art products mined from this reification, which we must reject. 1. Labour is, first of all, the free creativity of people working together. Second, labour is the human being’s communication with a resistant thing or with a foreign, external human will. Third of all, labour is a means of delaying the satisfaction of human desire in favour of executing an entire series of technical and ritual operations. Fourth, labour is the illusion or hallucination of having absolute power over a thing, of being able to bring it to life, of being able to make it human. 2. So actually, there’s freedom and non-freedom in labour. In addition to the work that you do to feed yourself, the work to which you are accustomed, the work for which you have a system of technical rules, you are also faced with work that is apparently unnecessary, which you only do because you have spare time. Something happens, even if we simply freeze  many games include coming to a full stop, cops and robbers, for an instance. When we work because there is little else to do, it will seem to us that we are playing, but later, they will tell us that our game was useful, which is how play becomes duty. However, without free, jubilant work, necessary work would never be able to exist.